Gunsmoke, on radio from 1952-1961, is perhaps the greatest radio drama of all - not just the best western radio drama. It is a perfect example of all the elements of creative broadcast radio coming together week after week to create a place and time in your mind (Dodge City, mid-1880's or so), populated with living people who you grow to know personally and care about. Chester, Doc, Kitty and Matt Dillon, US Marshal, "the first man they look for, and the last they want to meet." become as real to us as our neighbors. The cast featured Parley Baer as Chester, Howard McNear (who went on to be Floyd the Barber on TV's Andy Griffith Show) as Doc, and Georgia Ellis as Kitty, The weekly supporting casts were always well drawn and believable. Producer/director Norm Macdonnell, the creative genius who made the show what it was, always took care that everything sounded just right. William Conrad, already a major radio actor with terrific work on Escape, was at first overlooked as being ubiquitous. But they tested him anyway, and he was Matt Dillon right from the start. The role became Conrad's greatest achievement, and must be considered as perhaps the best portrayal of show character ever heard on radio. Conrad was distraught that he wasn't considered to play Matt Dillon on TV, being short and heavy, but he went on to a solid career in TV (best remembered for the series Cannon). 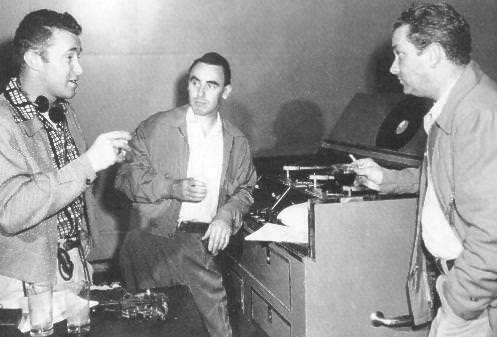 Sound engineers Ray Kemper, and Tom Hanley, along with producer/director Norman Macdonnell.The old time radio show is Gunsmoke at its most creative and varied. The gritty dialog of the superb scripts, the honest acting, sound effects and music makes Dodge as real as any place ever created on radio. For example, Kitty's saloon scenes featured a real honky-tonk "pieannah" being played live in a crowd of extras as the show was transcribed. Gunshots were the authentic weapons recorded and carefully mixed. The staff was the best in the business. Happily, we have the whole run of the old time radio show, so "the story of the violence that moved west with young America, and the story of a man who moved with it" will live on. See also: Best of Gunsmoke Collection for some of OTRCAT's favorite epsiodes of this classic western show. Gunsmoke lasted a long time because every episode is a good one. I know I'll be listening to it for a long while. It's a great testimonial to the power of the mind (The theater of the mind) used when listening to a radio show. The same story on TV are less. I think Gunsmoke, when Dennis Weaver was in the cast, is the closest one gets on TV and then it was not as good. A number of the stories on radio were repeated on TV and Dennis Weaver better captured the character Chester but the version he presented was too wimpy. It also shows what a wonderful writer John Meston was having shows that he wrote used in both the radio and TV version. For the life of me I don't understand why Meston didn't get better recognized for his work since it shows if a story is well written it makes all the difference. It's too bad that radio and for the most part TV has morphed now into something less than worthless. I have recently become disabled. I have had 5 surgeries on my back and have spent many nights just laying quietly in bed listening to the OTR shows. I have to admit that Gunsmoke is one of my favorites. Thank you for your show. I took advantage of your online sales. God Bless. I am enjoying all of my downloads immensely and am a huge fan of what you folks do and the priceless entertainment that you provide. The ability to download these wonderful programs was an awesome enhancement and also much appreciated! I just wanted to express my appreciation to this company for these shows! I have thoroughly enjoyed many evenings listening to not only Gunsmoke, but many other shows I have purchased. Some of my favorites are; Father Knows Best (though it reminds me too much of myself haha), Yours Truly, Johnny Dollar and Charlie Chan. These shows are perfect in quality considering their age and something you will not regret. Thank you very much for such a great product! 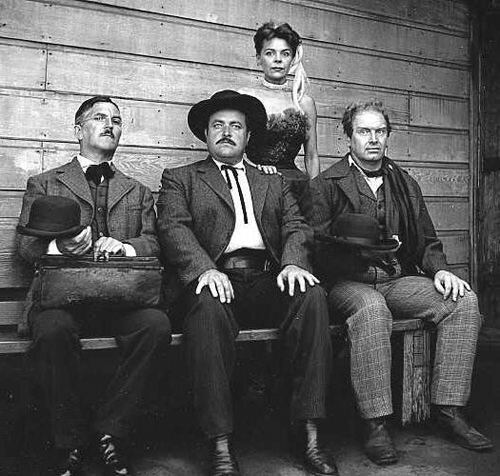 I downloaded all of the Gunsmoke series 10 yrs ago and put it on an Ipod and have been playing the shows every night on the same ole Ipod and know them all by heart and to watch Gunsmoke on TV they took all of the radio shows and put them on television so I make the rest of the family mad when I give up the plot to the show..hahaha! Also thru the years I've found that when someone yells when they get shot they yell a curse word and in the rehearsals there's a lot of messing around and having fun while rehearsing..It only took 10 yrs to find that out....hahaahaa! I have been listening to Gunsmoke. Matt treats Chester like an idiot in all of the episodes I have heard so far. Does this continue throughout the entire series? I cannot specify the episode, but Chester was beaten almost to death, and when he survived he wanted to resign, because he had failed to do a job Dillon gave him. Matt absolutely refused and said, \"You\'re the only man in Dodge I can trust.\"
Pretty much. My mother watched it on tv until it went off. I never really got the thrill though I can remember watching it as we only had 3 channels in those days. When I discovered the OTR version, it made so much more sense. I like Parly Bear. The writing was superb. I think the writer for the majority of the episodes was John Maxtor. He also wrote a lot of the TV shows. Some of the radio shows were adapted for TV.Bill Conrad was considered for the TV role but he was too chunky. I haven’t heard that when I listen. Chester defers to him ..he’s the boss..but I think Matt respects him. Chester drives Matt a little crazy sometimes but he\'d drive me crazy too at times. Matt respects Chester though and knows that Chester will do whatever he asks, however he asks him to do it. As someone previously said, Matt tells Chester that he is the only man in Dodge that he can trust. Earlier episodes Matts disgust with the behavior of Chester and Doc is more pronounced. In time their characters become more lovable and less foolish and Matt suffers them a little more gladly, and they become an inseparable unit. Gunsmoke. I knew it existed, but I didn’t think I’d like it and am pleasantly surprised. Well-written and not afraid of controversial issues. In a way Gunsmoke in my second round of listening to radio. I have just heard it since I have been listening to OTR (I heard it on Sunday\'s WAMU broadcasting OTR on Sundays.) In my first round at radio when I was young, in the 50s I never heard it because then I didn\'t like westerns.